When you travel in an RV, home is wherever you park it. But the comforts of home — those depend on your RV furniture choices. 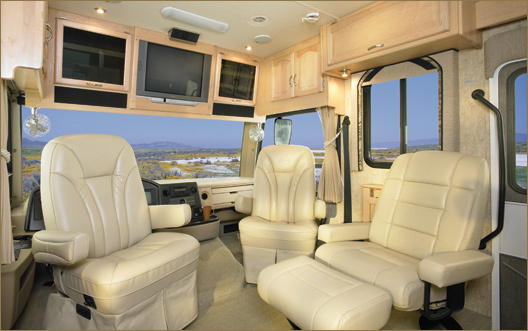 From your dinette set to your RV mattress, your chairs & recliners and everything in between, your rig’s furnishings can keep you sitting pretty in the lap of luxury no matter where in the world the road takes you. But if your travel trailer or motorhome has a few miles under its belt, or even if you’re just looking for an upgrade from the standard, you may be in the market for some furniture replacements. Just like selecting furniture for your sticks-and-bricks home, choosing RV furniture can be a fun renovation project, but it can also be overwhelming — not to mention expensive. The quality of your upcoming camping trips depends on how comfortably your motorhome is appointed, so it’s a pretty high-stakes situation! But that’s okay. We’re here to help walk you through your RV furniture choices, providing tips and tricks on what to look for in many classic pieces of RV gear as well as offering ways to find great, cozy pieces on a miniscule budget. So — ready to start renovating? Here’s our ultimate guide to finding, purchasing, and enjoying the best RV furniture on the market. Before we dive into the nitty gritty on what to look for when shopping for specific pieces, let’s talk about RV furniture as a general concept. While your rig’s chairs, tables, sofas and beds might seem like fairly straightforward features, they share the same unique benefit the rest of your camper does: they’re totally customizable! After all, the whole point of a motorhome or travel trailer is to travel in a way that meets both your comfort and convenience needs. So if you’re considering some interior renovations or furniture replacements, don’t forget that you can totally overhaul the original layout if you see fit. This is especially true if you’re planning on taking to the road for long-term road trips, or even considering living in your rig full time. You want your home away from home to feel… well, homey. And that means taking design matters into your own hands. For an example of what we’re talking about, check out how Chris Dunphy and Cherie Ve Ard of Technomadia transformed the interior of their vintage bus, Zephyr. Since they live (and work!) on the road full-time, they had to take their specific lifestyle needs into consideration. To that end, the couple installed a custom computer-friendly workspace as well as tackling aesthetic upgrades, like reupholstering the pull-out sofa and, replacing the bathroom countertop and adding a chic vessel-style sink. What does all this mean for you? Don’t be afraid to get creative! Maybe you’re traveling with a big family, and that pull-out dinette set just isn’t cutting it. Why not install another sleeper sofa, or even a set of bunk beds? On the other hand, if you’re traveling solo, all those additional sleeping surfaces might be totally extraneous. You could easily trade them for furniture that features extra storage space, which might suit your needs better. No matter what, always remember that your RV’s set of furnishings and overall layout is totally within your control — and totally changeable. Makes the prospect of those renovations even more exciting, right? No matter what specific pieces of RV furniture you end up including in your final RV footprint, finding the very best products is both important and time-consuming. Even if you get a good deal on a new set of RV recliners or a table, it’s a waste of money if the furniture ends up being uncomfortable or dysfunctional. 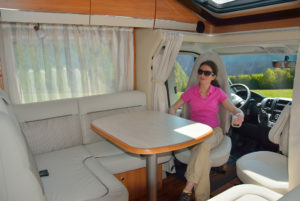 So here are some general tips to help you ensure you get the very best RV furniture for your money, no matter which items you’re in the market to buy. It’s definitely easy to get swept up in the excitement of your renovation project. We totally understand wanting everything in your RV to look absolutely perfect and ready to go… right now. But nobody makes their best decisions when they’re rushed. In fact, if you’re hurrying through the shopping process, you’re a lot more likely to end up wasting money on an overpriced product — or worse, experiencing buyer’s remorse when you see something you like better just a few days after you make your investment. That’s why we recommend taking your time when you’re making upgrades to your RV. It’s way better to wait it out and end up with a rig full of pieces you love than to get everything done right now only to have regrets almost immediately. Even if you’re planning on taking a trip in the interim, you can make your upgrades piecemeal — that old sofa won’t make your camping trip any less amazing, especially since you’ll likely spend a lot of it outdoors! 2. Shop around to compare pieces and prices. My momma told me… you’d better shop around. While those song lyrics might be in reference to one’s love life, the same can certainly be said about La-Z-Boys — or any piece of RV furniture you’re considering. Every once in a while, the very first chair, sofa, or mattress you find might actually be The One. But in general, you want to give yourself the opportunity to check out a few different options before you settle on a decision. That way, you’ll have a point of comparison to make you feel more confident about your purchase. 3. Pick it out in person, if at all possible. This may be the golden age of purchasing things online and having them shipped effortlessly to your door — but there are still some items you’ve just got to try before you buy. High on that list, in our opinion: jeans, shoes, and definitely furniture! If you can, it’s well worth visiting vendors in person to give those chairs a sit and those mattresses a lie-down. No amount of online research can replace the knowledge you’ll glean by actually experiencing the furniture first-hand. And don’t worry – you can still go home and buy online after you know exactly what you’re in for. Depending on what part of the country you call home, of course, you may not have a plethora of furniture retail options within easy driving distance. It’s fortunate that many furniture vendors offer a return policy or trial period, so you can ensure that your new mattress is actually comfy-cozy — but it’s still highly preferable to go try it out before you buy, so you avoid having to deal with the headache of the pickup and refund. 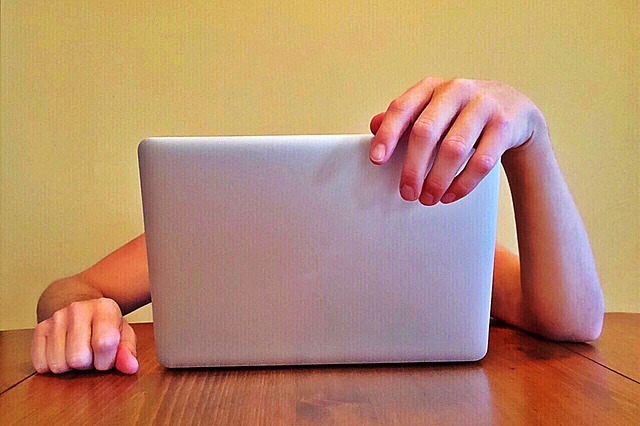 As much as we love using camping as an opportunity to disconnect from our all-digital-everything age, there’s a lot to be said for the magic of the internet — especially when you’re trying to make the most informed buying decisions possible. That’s because all sorts of retailers now include customer reviews to help future customers have a better understanding of the product before they click “add to cart.” And even if you’re shopping in person (which you are, right? ), you can still take the opportunity to scope out the item online before you actually hand over the cash. Who knows? That mattress might feel comfy now, but maybe its cushy memory foam is destined to go limp and lumpy in just a few months. That cool-looking dinette set with the under-bench storage might seem absolutely perfect… until you learn that the hinges have a reputation for rusting out instantaneously. User reviews can give you insight into all sorts of issues you’d otherwise have no idea were coming. Just don’t forget that the people most likely to leave reviews in the first place are either the super-happy customers or the super-bummed-out ones… so do take those star ratings with a grain of salt, and read a decent number across the spectrum before you dismiss or decide on an item! Not only is professional installation an extra expense… it also deprives you of a fun opportunity to get your hands dirty and do the upgrade yourself. There’s nothing quite as fulfilling as completing a beautiful renovation with the knowledge that your own sweat and elbow grease went into it. Plus, when you’re doing it yourself, you know the job will be done correctly! Of course, if you’re uncomfortable performing furniture removal or installation, hiring professional help can be a worthy investment. Better to spend a little extra change than to inadvertently damage your new furniture — or the rig itself. Just don’t forget that these days, there’s a YouTube tutorial for just about everything, and that includes replacing your sofa or upgrading your dinette to a second sleeper. 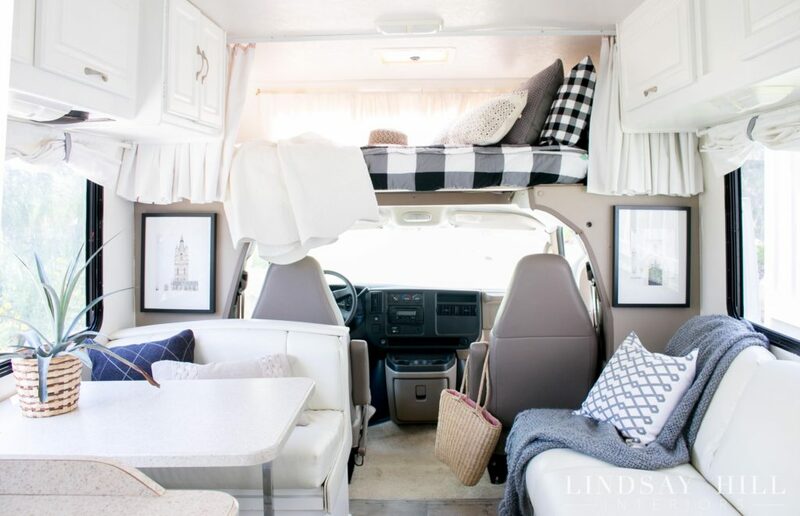 Now that we’ve covered the basics to help you shop (til you drop) for the best pieces out there, let’s talk about what kinds of camper furniture options are out there and what to look for in each — as well as where to shop for those pieces and how to find them as affordable as possible. Newsflash: the chairs in your cockpit are really important. They often perform double duty, serving as the safe and stable seats you’ll sit in while you’re underway by day and then swiveling around to moonlight as cozy lounge chairs by night. So if you’re planning on replacing the RV chairs at the front of your motorcoach, you want to ensure you look for something that combines functionality with comfort. Seatbelt capabilities are a must — safety first! — but you’ll also want to ensure the chair is both plush (for relaxing) and supportive (for staying ergonomically correct during long days navigating those highways). Another factor to keep in mind when shopping for new RV seats is the upholstery. Leather is beautiful and easy to clean, but if you primarily camp in areas with hot weather, you may find yourself sticking to your seat, which is no fun. Fabric, on the other hand, can attract pet hair and other debris, though it may be more affordable. Along with the front seats, you might also be interested in replacing your RV recliners or wall huggers — or installing them instead of your existing dinette or sofa set. Many of the same concerns apply here, too; the best seating has both support and softness. However, the specific design that most appeals to you will depend on your lounging type. If you like to cuddle up, for instance, you may want to stick with a loveseat or sofa; if you’d rather have room to stretch out and maybe even stash your favorite snacks, a double recliner with cup holders or a tray table might be the better option. 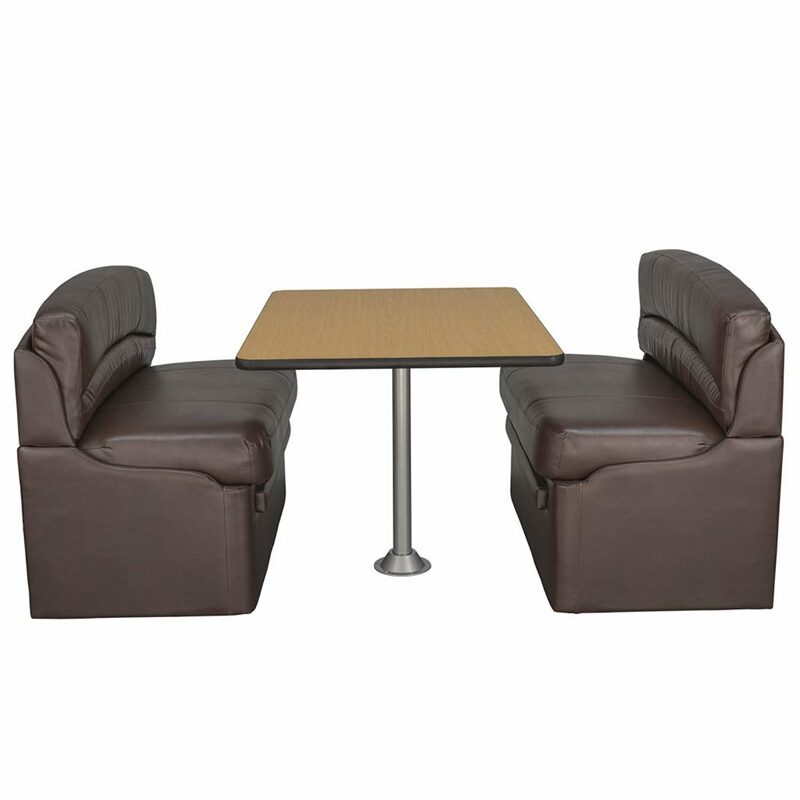 RV dining areas come in a couple of different configurations. You might have a table with separate, individual chairs, or a booth-style dinette with plush, upholstered benches (as pictured above). Those benches might open up to reveal under-bench storage, or fold down to create an additional sleeping space. But the bottom line is, you’ll need to figure out which of these different styles of dinette is best for you. If you’re traveling with a big family, for instance, having the extra bed might be of vital importance. But if you’ve got a lot of adventure gear in a relatively small rig, that under-seat storage could be a life saver. You’ll also want to take the size of the table itself into consideration; some RVs feature a folding table that has a leaf to extend the surface for extra place settings. When it comes to your RV couch, it’s all about comfort and functionality. Do you need it to slide out into a sofa bed, or will a wall hugger style set of recliners work? Cupholders: yes or no? And again, keep upholstery choices in mind when shopping for this piece of RV furniture. Leather is lovely… until you’re trying to get your Netflix on in pajama shorts during the high summer months. If there’s one piece of RV furniture you’ll want to replace ASAP, it’s likely to be your mattress. And fortunately, it’s one of the easiest replacements to make — all you have to do is pick up the old one and pull it out of the rig. However, you need to pay close attention to your existing mattress’s measurements. 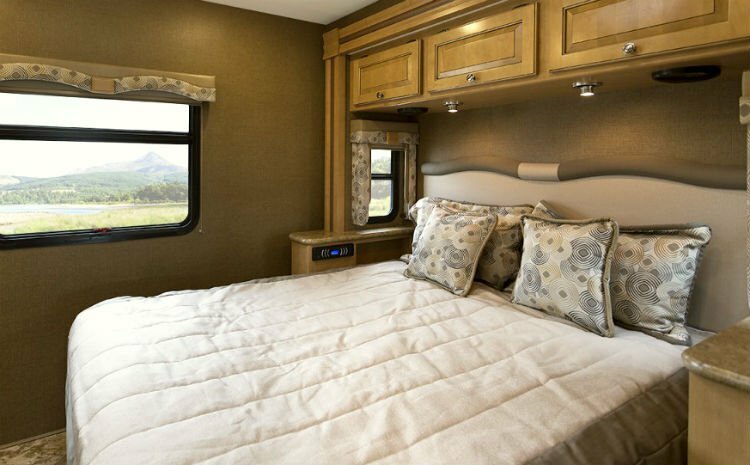 RV mattresses aren’t sized the same as their standard counterparts, usually shaving off a few inches of length or width to accommodate an RV’s abbreviated footprint. Additionally, if you have slide-outs in your bedroom, you may need to look for a mattress that’s foldable to ensure those mechanisms will have room to work. Also keep in mind any additional bedroom furniture, like your night stands or RV end tables, which will impose additional limitations on the dimensions of your mattress. The same goes for non-traditional configurations, like bunkhouses. Now that you know what you’re looking for, let’s tackle the next problem — where to look! We’ll also recap what you need to keep in mind while you’re shopping to ensure you find quality furniture that’ll keep you a happy camper for many years to come. Where Should You Buy RV Furniture? RV furniture is available from a wide array of retailers. Along with general camping and motorhome suppliers, like Camping World, there are also plenty of specialized RV furniture dealers out there. A few to check out are RV Furniture Center, RV Parts Nation, and Factory RV Surplus. If you live nearby any of these dealers or other locally-owned, mom-and-pop RV furniture vendors, they offer a valuable opportunity to go and try out the pieces in person. But these days, RV furniture is also av available online, either through Amazon (like everything else!) or generalized furniture dealers like Wayfair. If you do make a purchase online without trying the item out first, make sure you understand the return policy before you commit to buying. You definitely want to have the option to return the product if it doesn’t end up working out for your needs. You can also look into purchasing used RV furniture, which may be listed in your local newspaper classified ads or on Craigslist. However, there are a few extra things to keep in mind when you’re shopping used furniture — but don’t worry, we’ll get back to that just a little bit further down in this post! We’ve already talked through most of the features and benefits of different types of RV furniture — but for your convenience, we thought we’d give you a quick little cheat sheet of items to keep in mind while you’re on your search. Measurement and fit. Regardless of any other factor about a prospective piece of furniture, if it doesn’t fit in your RV, it’s… well, not a fit. So make sure you have those measurements accurate! Upholstery and style. 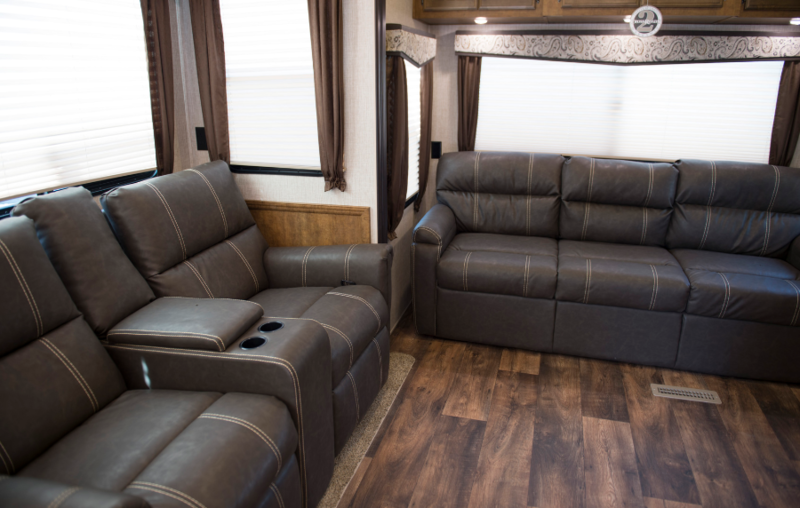 Along with deciding whether leather or fabric works better for your needs, you’ll also want to consider colors and general style and how everything fits together inside your RV’s interior. Not everything has to match, but sticking to the same general color palette and design style can help your rig’s interior feel cohesive and enjoyable. Storage capacity/multi-utility. Unlike when you’re shopping for home furniture (unless you live in, say, San Francisco), in your travel trailer or motorhome, every single square inch of space matters. So finding furniture that does double duty as an extra storage or sleeping space can help ensure you’re making the most of your rig’s limited footprint. Cost — including shipping/delivery/installation. For most of us, budget is one of the foremost factors in any purchase decision. But with heavy furniture, you’re likely to run into expensive delivery or installation charges. Be sure you find out the total of your prospective purchase including these extras before you sign anything. Otherwise, that great-sounding deal can quickly look a lot more like a rip-off! Remember furnishing your first apartment? Chances are your decor decisions were made on the basis of what used furniture was available, rather than some fancy lookbook. But even for more mature and established campers and home-owners, buying used furniture can be a great way to save money… and maybe even get some unique, vintage pieces into your camper! However, you don’t want to go out and start purchasing pre-owned pieces willy nilly. Unlike furniture that you buy brand-new off the factory floor, when you buy used, you don’t know exactly where it’s been — or what it’s been through. And in some cases, that could lead to disaster. Wooden furniture can also be pest-ridden, so look for the tiny holes and sawdust that signifies the presence of common furniture beetles. It’s also a good idea to ask the owners if pets have ever been allowed in the RV or on the furniture — fleas can lie dormant for months, quickly spawning a new infestation at the first opportunity. Even if used furniture looks clean, always give it a thorough cleansing before introducing it to your RV’s interior. Machine wash any slipcovers or external fabrics in hot water, and use a disinfectant cleanser to ensure hard surfaces are free of dust, debris, and germs. Finally: when you’re buying used, negotiate! One of the best parts about buying used furniture is the flexibility of the pricing. Check the piece for any nicks, dings, scratches, or tears, which can help your argument for a lower price point… but even if everything’s ship-shape, don’t be afraid to offer a slightly lower number. The worst thing the seller can say is no! 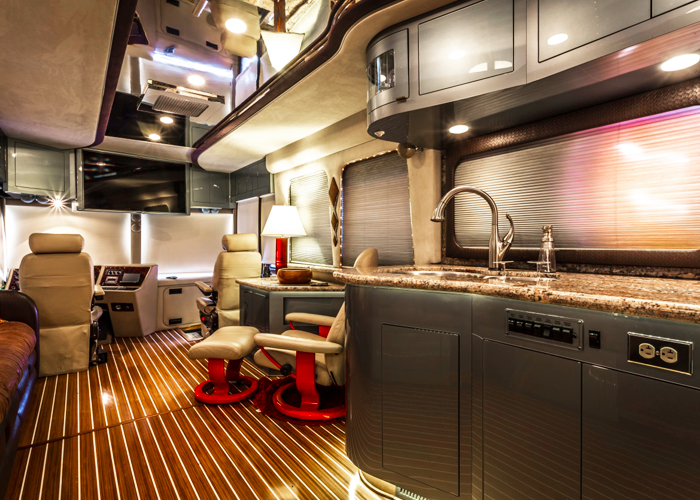 Looking for Even More RV Renovation Ideas? 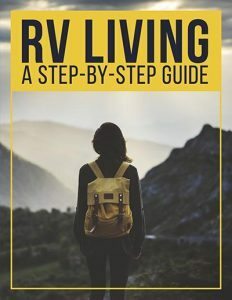 We hope this guide to RV furniture has both helped you spawn new ideas for your RV’s interior and given you a sense of how to approach the shopping process to make your RV furniture purchases solid and stress-free. However, there’s way more to a full RV renovation than purchasing a new sofa. And even if you’re not ready for a total interior overhaul, there are plenty of ways to make your rig’s interior feel fresh and new. 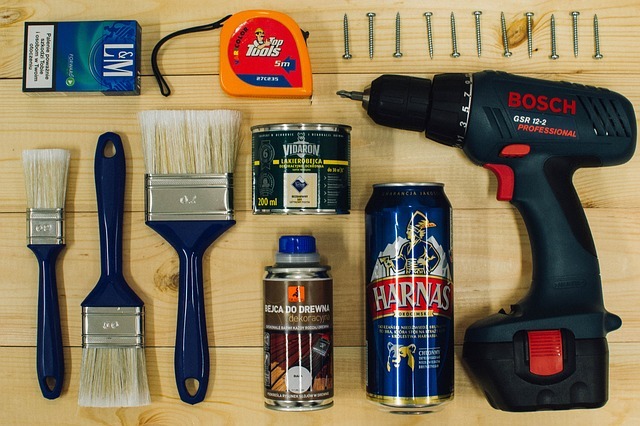 It can be as simple as adding a coat of paint to your RV cabinets or investing in some fun and unique RV accessories. From affordable camper decor to RV bedding ideas, we’ve written a ton about how to make easy and effective RV upgrades here at the RVshare blog — as well as some fodder for those considering more substantial rebuilds and upgrades. 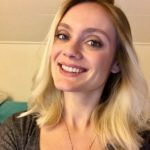 So if you’re looking for even more ideas for an upcoming renovation project (or just want to brainstorm and drool over some creative campers’ remodels), check out the following RVshare blog posts. Sometimes, even the simplest touches can mean the difference between a motorized house… and a motorhome. Camping is all about staying comfortable while heeding your sense of adventure and exploration, and outfitting your rig with the right furnishings and decor can help you bring that sense of comfort with you no matter where you’re headed. Happy (and comfy) travels, campers!